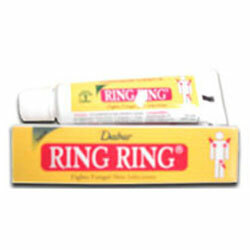 Dabur Ring Ring For Quick relief from ring worms and fungal infections and it treatment of skin infections. Dabur - Ayurvedic Specialities - Worldwide Shipping. Dabur Ring Ring For Quick relief from ring worms and fungal infections. For treatment of skin infections caused bt ringworms: Tinea Cruris, T. Corporis, T. Pedis, P.Versicoor, Candidiasis and Gram Positive Bacteria. Wash and Dry infected area and apply New Ring Ring gently twice daily and continue for one week after the problem has disappeared. Discontinue if hypersenstivity occurs. Use with caution during pregnancy. Consult doctor if problem persists.